"This simple, spicy kebab dish allows you to replicate the delicacy sold by Nigerian street vendors." Mix ground peanuts, cayenne pepper, paprika, salt, ginger, garlic powder, and onion powder together in a bowl. Combine spice mixture and beef in a resealable plastic bag; shake until well coated. Marinate in the refrigerator, about 30 minutes. Place beef, bell pepper, onion, and mushrooms in alternating order onto skewers. Cook on the preheated grill, flipping once, until meat is browned and vegetables are soft, 10 to 15 minutes. Chicken or pork can be substituted for the beef. If using an oven, preheat to 400 degrees F (200 degrees C). Place loaded skewers across a baking pan. Cook, flipping once halfway through, until browned, about 5 minutes per side. 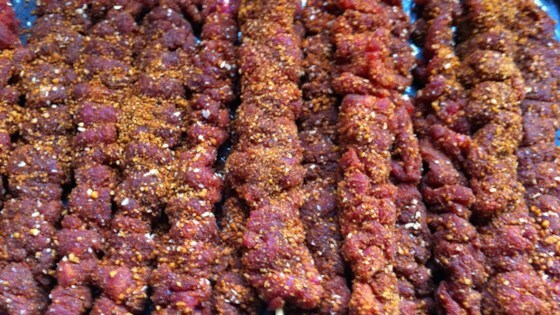 Obviously a nice enough marinade for beef/meat, but definitely not Nigerian suya.